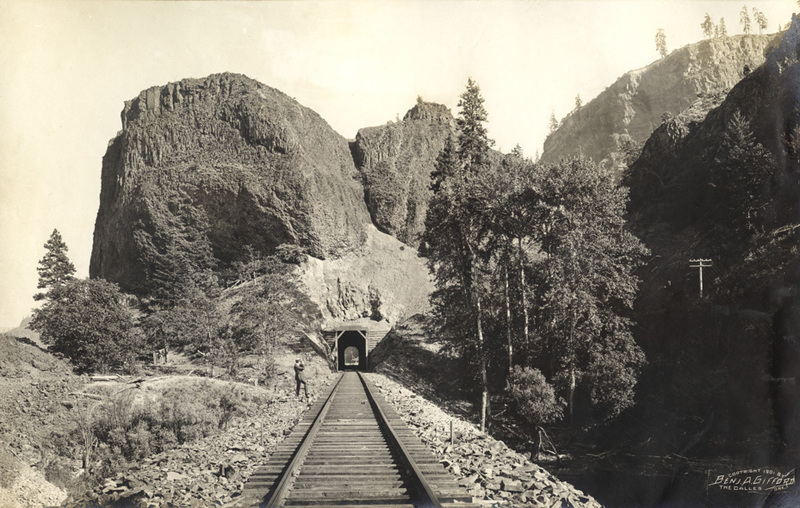 This Benjamin Gifford image was included in Earl Conser's photo album of his work on the track realignment between Hood River and Mosier in 1900-1901. There's a good chance Conser met Gifford when Gifford documented the project. Arthur, do you think any of the other Conser photos could have possibly been a Gifford photo. L.E., this photo and the one of the crew removing the old rail are clearly professionally printed, with Gifford stamps. All the others are random sizes, many show signs of amateur developing (failure to fix, rinse, etc). I suspect Conser traveled to Gifford's studio in the Dalles to buy some professional images to round out his album. He's worked them in to the "story" of the album very well. While it is not fancy-- plain paper and glue-- I think he was very proud of his work on the railroad and wanted to memorialize it. The wood portals on this 1903 tunnel were replaced with the present concrete in 1923. I-84 took off a large part of the rock on the left where the original RR grade existed, this is obvious when driving by at this county line location. Looking under Gifford and under railroads for the picture of the first train bypassing Rowena, any clue where it is hiding ?